Forty years ago, Punta Cana was almost unheard of, a far cry from the famous beach destinations it has become today. Old airstrip Punta Cana This transition began when, in 1969, a group of American investors bought 30 square miles (77 km2) of undeveloped Dominican land straddling 5 miles of the nation's east coast. At the time, this land was no more than thick, forbidding jungle without any access roads; the only signs of human life were a few fishing villages along the coast. The savvy investors saw the beaches, however, and their white sand, coconut palms, crystal clear waters, and lush coral reefs. 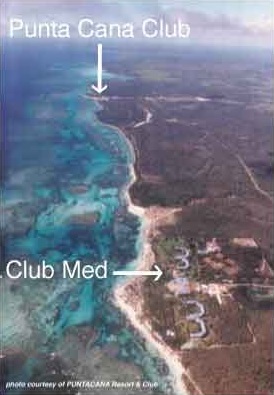 Old image of Punta Cana Club Wisely changing the name of the land from Punta Borrachon ('Drunken Point'), the investors called the land Punta Cana, after the Punta Cana Club, a local hotel. 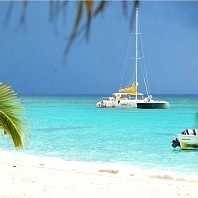 Punta Cana soon began to attract attention from the rest of the world. Dominican fashion designer Oscar de la Renta and international music artist Julio Iglesias were among the famous early guests and investors. 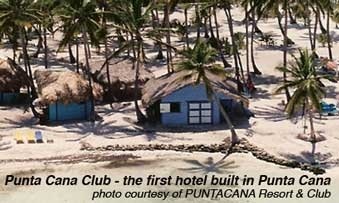 In 1971 the first hotel, with room for 40 guests and 10 cabins, was built within Punta Cana itself. The access to the hotel was limited to a dirt airstrip, allowing only small planes. The initiative got noticed locally and oversees; with this tourism in Punta Cana took off. By 1978 the French resort chain Club Med had constructed a 350 room Club Med Punta Cana, but at that time the area was still fairly wild. Toothpaste company Colgate finally stepped in and connected the area by road to the rest of the island, reducing travel time into the area from 6 hours down to half an hour (from the nearest town). The area continued to grow, and in 1982, the owners of the Punta Cana resort received permission from the Dominican government to build a proper commercial airstrip, which was opened in 1984. The area is still somewhat remote, but during the years that followed fast improvement to the road network were made. In 2012 the new Coral highway has opened and it connects Punta Cana with the rest of the island. Instead of 6 hours, it now only takes 30 minutes for the trip to the town of Higuey. In 1982, after years of negotiation and going back and forth, the Dominican government gave permission to the owners of the Punta Cana Resort to build a real airport, so that bigger planes could land. By 1984 the first real airport was operational. Thereafter, the number of annual visitors grew rapidly from 2,976 passengers to almost 2.4 million people 30 years later. Many of these visitors are loyal fans who have been coming back for years, drawn back by an incredible beach vacation in one of the luxury resorts along the coast. Currently there are over 60 resorts, stretched along a strip of 30 miles of beautiful beaches. These resorts, along with the different businesses which have flourished due to the onset of tourism, have become the backbone of the local economy. 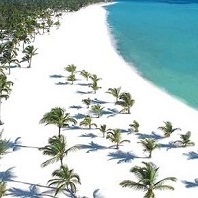 It is worthwhile to note that today approximately a quarter of the country's GDP is made in Punta Cana. The initial investors couldn't have dreamt that the area would become so important for the entire country. © The images in this article are courtesy of Punta Cana Resort & Club. 1966: Trujillo's protege remains in power for the next 5 re-elections.